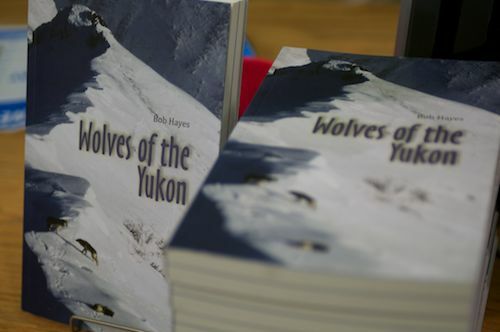 Former Trent Student Bob Hayes Talks About His New Book "Wolves of the Yukon"
Bob Hayes recently dropped by Titles Bookstore in Peterborough to talk about his new book, Wolves of the Yukon. Bob, who is an alumnus of Trent University, described the writing process as "a full year of writing that took ten years to write." Bob left Peterborough in 1975 and went to the Yukon to research and write about Yukon wolves. This book is a compilation of 25 years worth of knowledge as a wolf biologist. When writing the book, Bob felt he had to tell stories to keep the reader engaged but found it difficult with his past of writing scientific papers. But he managed to pull it off, and Bob gives thanks to his family for helping him through it as it truly was a joint effort: His family helped him research the book, his daughter edited it, his brother provided the drawings, and a friend of his daughter provided the maps. Drop in to Titles Bookstore to pick up a copy of Wolves of the Yukon.